Some nations see hope while Iran warns that the U.S. is an unreliable partner. At all hours of the night, from all corners of the globe, the world watched. China praised the outcome of the summit, in which President Donald Trump pledged security guarantees to the North and and Kim Jong Un appeared to endorse complete denuclearization of the Korean Peninsula. “A new history has been made and China welcomes and support it” said Chinese Foreign Minister, Geng Shuang. China, the northern neighbor of Pyongyang, said it would be willing to play a constructive role in further U.S.-North Korea agreements. In Japan, Prime Minister Shinzo Abe applauded the "courage and determination" of the two leaders. But he added that he hoped to speak to North Korea about the Cold War-era abductions of Japanese citizens by North Korean spies. 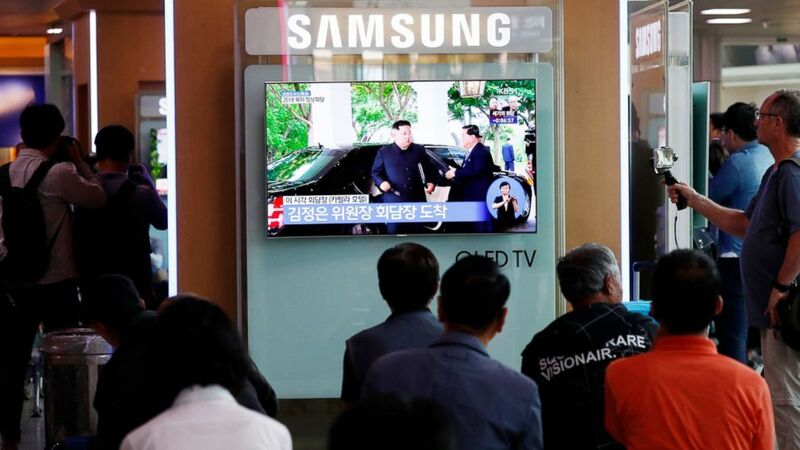 (Jeon Heon-Kyun/EPA via Shutterstock) South Koreans watch a TV screen displaying a broadcast of the historic meeting between President Donald J. Trump and North Korean leader Kim Jong-un in Singapore, at a station in Seoul, South Korea, June 12, 2018. “I’m determined that Japan will have to directly face North Korea and resolve [the abductions] bilaterally,” Abe told reporters. President Trump and Secretary of State Mike Pompeo both said the issue of the Japanese abductions was discussed in today's meeting. Trump was also asked about whether North Korea's human rights record came up at the summit, and he told ABC News that the issue was discussed "briefly" and then "at length." International advocacy groups like Human Rights Watch and Amnesty International didn't think that was enough. In contrast to the reaction of many nations, Iran issued a warning to North Korea. Now and in the months since Trump pulled out of the Iranian nuclear deal, Iranian leaders have sought to deliver one consistent message to North Korea: President Trump is an unreliable partner. "We are facing a person who backtracks from his signature as he travels on a plane," Iranian Government Spokesman Mohammad Baqer Nobakht told reporters Tuesday, according to semi-official Fars News. "I do not know with whom the North Korean leader is negotiating. This person is not a wise representative for the U.S."
President Trump decided after leaving the G-7 summit last weekend not to sign onto a joint communique. At the United Nations, meanwhile, Secretary-General Antonio Guterres called the summit "an important milestone in the advancement of sustainable peace and the complete and verifiable denuclearization on the Korean Peninsula." "The road ahead requires cooperation, compromise and a common cause," Guterres continued in a statement. "Implementing today’s and previous agreements reached, in accordance with relevant Security Council resolutions, will require patience and support from the global community. The Secretary-General urges all concerned parties to seize this momentous opportunity." 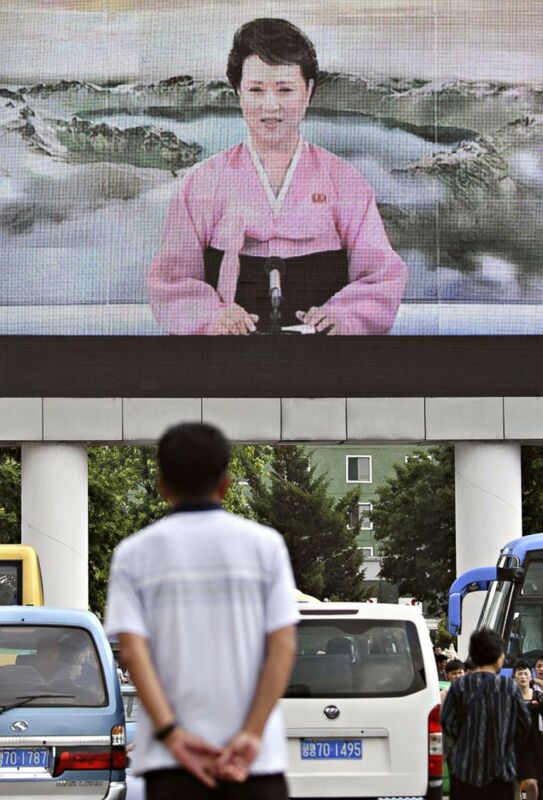 (Kyodo/Newscom) A man looks at a public screen on June 12, 2018 set up near Pyongyang station showing North Korean leader Kim Jong Un in Singapore for his meeting with President Donald Trump. In the United Kingdom, Foreign Secretary Boris Johnson called the meeting "an important first step towards a stable and prosperous future." Welcome the news that President Trump and Kim Jong Un have held constructive talks in Singapore. The DPRK’s commitment to complete denuclearisation of the Korean Peninsula is an important first step towards a stable and prosperous future. Prime Minister Theresa May’s spokesman said North Korea’s commitment to denuclearization is a sign that Pyongyang might finally be turning a corner. The British papers shared their front pages early, with news seemingly dominated by the summit. The Guardian Weekly's front page asks: "A great leap forward?" And the editor of the Evening Standard, tweeted out that paper's front page, with what appeared to be a tongue-in-cheek headline: "At last... A leader I can do business with" under a picture of Trump and Kim shaking hands.